I can't believe it has been so long since I've written a review. However, this book is what has taken me so long to get to. 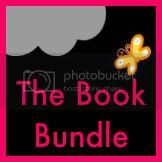 Masquerade by Melissa De La Cruz haunted my nightstand until I finished it. I would stare at it and realize that if I picked it up, I would have to sit down and finish it. Every time I looked at it while reading it, I would have this problem. Usually, that's the best sign a book is addicting. I'm hooked. I thought Blue Bloods, the first in the series, reeled me in but this book hooked me. I think the worm is the cover of this book. Just very mysterious with the eyes behind the beautiful mask. Here's a quick synopsis of what the story is about and I promise to try and not give too much away. 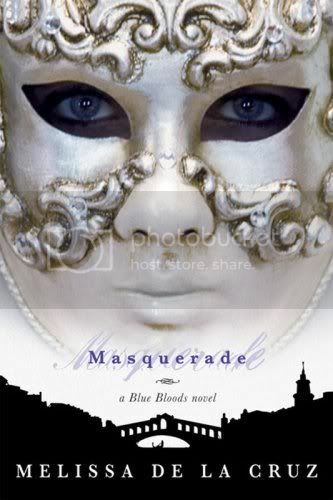 Masquerade, begins where Blue Bloods left off. Doesn't every sequel do this somehow? Anyway, we've met the characters, Bliss Llewellyn, Schuyler Van Alen, Mimi Force, Jack Force, and many others who come into more play. As many teenagers do, they all have social problems with themselves and with others around them. Mimi is jealous of Jack paying more attention to Schuyler than to her even though they are "bonded" which means in their past lives, they were together as husband and wife, etc. You get the drift. Mimi decides early on that Schulyer needs to go away some how. But how? And Bliss is frightened by red eyes in her sleep giving her nightmares, and with her many different places she is going in the middle of the night in sleepwalker mode. And who was her real mother? The one her father never talked about. Where did Dylan go? What happened to him? Then there is Schuyler, the half blood, the outcast of all the socialie scene in the Blue Blood world. Although she is one of the top teen models in New York now, she is attracted to Jack more than ever and really looking for answers about Croatan or also known as, Silver Bloods. Going to Venice with her best friend, Oliver, to find her grandfather, she learns throughout the story--as well as everyone else does--that she is more like her mother, Allegra Van Alen, than ever before. She is, or may possibly be the strongest of the Blue Bloods and also, the only one that could defeat the Silver Bloods if they ever rose up and took to war. Of course, these three mini storylines all mingle together and weave in and out of each throughout the book. Every page is a turner, and I know I had to look ahead always and read the last paragraphs of certain chapters to see if they may leave me hanging or they would let me be. As always in gripping stories, I could only find maybe one or two spots that I was comfortable putting the book down and waiting for the perfect day to sit down and read some more. Even if you read, Blue Bloods, and like it in a mediocre way the way I did, go and pick up Masquerade, and just try to not read this in one sitting. Luckily, I did it that way, but then again, it also took me weeks to get through it since I feared I would leave my motherly duties in order to read this book.